Experience the best of life and living at Huntington Village in Charlottesville, Virginia. Charlottesville was recently voted the number one place to live in the United States by two formidable publications: USA Today & Frommer's Travel. A Huntington Village Townhome is an investment in your peace of mind. 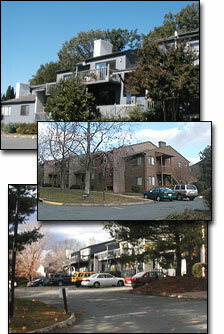 Huntington Village offers proximity to both the University of Virginia and downtown Charlottesville. Amid 13 acres of rolling Albemarle countryside, fronting Old Ivy Road, Primary and interstate corridors are only a three minute drive away. The UVa Rotunda, Bayly Museum, Culbreth Theatre, University Hall Sports complex, and many restaurants and shopping areas are all within walking distance. The UVa Medical, Chemistry and Engineering graduate programs are also nearby. Each Huntington Village Townhome contains features only found in today's most elegant homes. Glass sidelights brighten the foyer, accented by a decorative brick fire wall. The spacious family room features a brick wall and a fireplace that will turn your home into a cozy haven on even the most blustery winter days. Sliding glass doors open onto private patios or decks, many with a stunning view of the Blue Ridge Mountains. Most homes feature a separate living room as well. Kitchens are outfitted with modern appliances including a dishwasher, disposal, frost-free refrigerator, and range with self-cleaning oven. A floor-to-ceiling pantry and a breakfast bar or breakfast nook add style and function. Additional features of a Huntington Village Townhome include 2 or 2 1/2 baths, washer and dryer hook-ups, insulated windows and doors with either draw draperies or mini-blinds, an energy-efficient heat pump, and an abundance of storage space. Each master bedroom has an oversized, walk-in closet as well. All homes have either one, two, or three fireplaces and many include a full unfinished basement. During the summer months, residents can enjoy swimming or sunbathing at the Huntington Village pool. Townhomes range from $1,520 to $1,730, some of which are pet friendly. To schedule a personal tour or for more information, call 434-971-9764, ext. 103 or email us at erikgivy@gmail.com . view complete Huntington Village photo tour. Click here to see EXACTLY how close we are! Site design by East/West Web Co.